The fallout of traditional parties and the emergence of new alternatives has come to tear up the relative homogeneity that existed across PP and PSOE voters. The electoral demand has become more fragmented along with the segmentation of supply, but we are still far from a whole understanding of how and to what extent has this happened. The capital importance of the left-right or centre-periphery cleavages to understand the electoral market is taken for granted. Probably that is why these divisions get so much attention (most of it well justified) by analysts, journalists and politicians. However, there are more ways to look at this supply-demand relationship. Age, occupational structure, labour market position… These relations have strategic consequences for parties. And although class vote has not historically been a determinant aspect of the party system, the situation might be evolving in that direction, at least to a certain extent. Every party depends on specific social profiles among others. These are their core constituencies. To locate it and compare it with the overall social profile of the Spanish population we should observe the distribution of its voters and sympathisers across a series of variables. This is not about who ‘wins’ among the young, the old, the rich or the personal services employees. It is about knowing which percentage of the party’s constituency corresponds to each category. The distribution of supporters across age gives a good and particularly relevant data point to understand the emerging party structure. 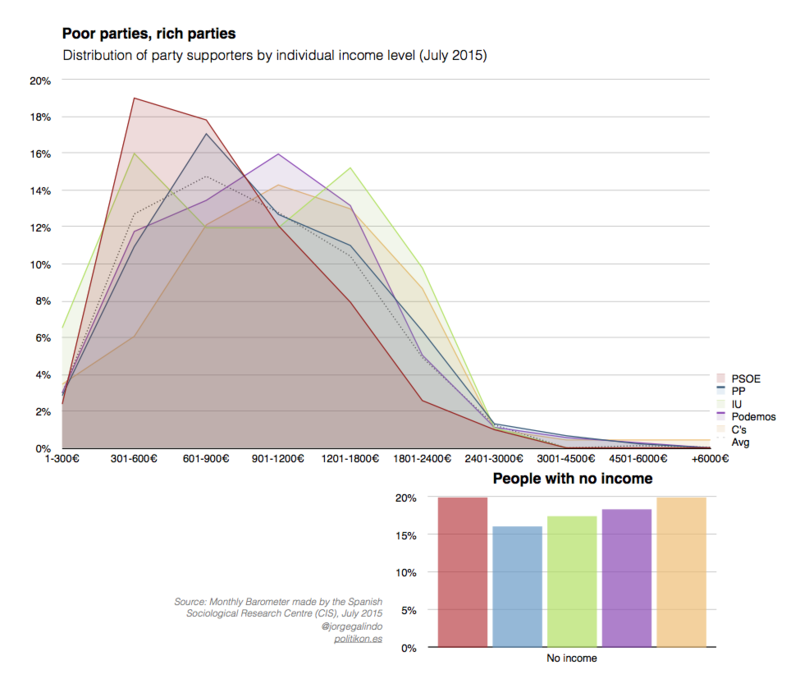 The next panel shows such distribution for each of the five main parties competing at the national level. Together with the percentage that corresponds to each party and age group I annotate the difference (in percentage points) with respect to the distribution across the whole population. For example, 11% of Podemos’ supporters have between 18 and 24 years, 2.8pp above the average of 8.2%. But even when the youngest Spaniards are overrepresented in Podemos more than in any other party, they are only the fifth largest age group in the platform. In any case, it is true that Iglesias’ is the youngest organisation. At the other extreme, 39% of people supporting the PP are older than 64 years. This represents 15.5pp more than the average. Spain has an aging population: 23.4% of it is above 64. But the “population” of the PP is so much older. 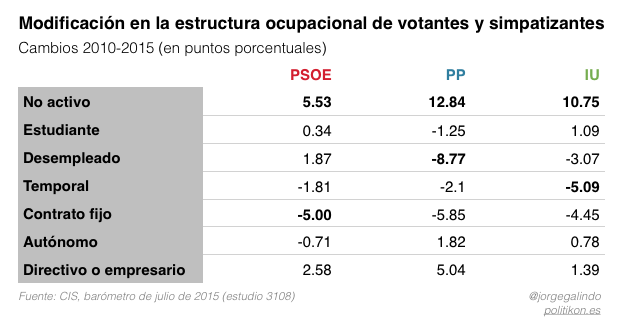 Even more than for the PSOE, whose structure is also significantly skewed toward senior citizens. As a matter of fact, “the party of those who do not work” might be a good tagline to define the PP: 46.4% of its supporters are not part of the active population*. The PSOE comes right behind. Needless to say, this distribution is intimately related to age. New parties do not have more than 17% of non-active voters. Podemos looks like a coalition between insider and outsider-based households. Ciudadanos, on the other hand, is considerably more skewed towards self-employed and managers, keeping still a strong base of insiders, although quite different from that of Podemos as it will be shown below. 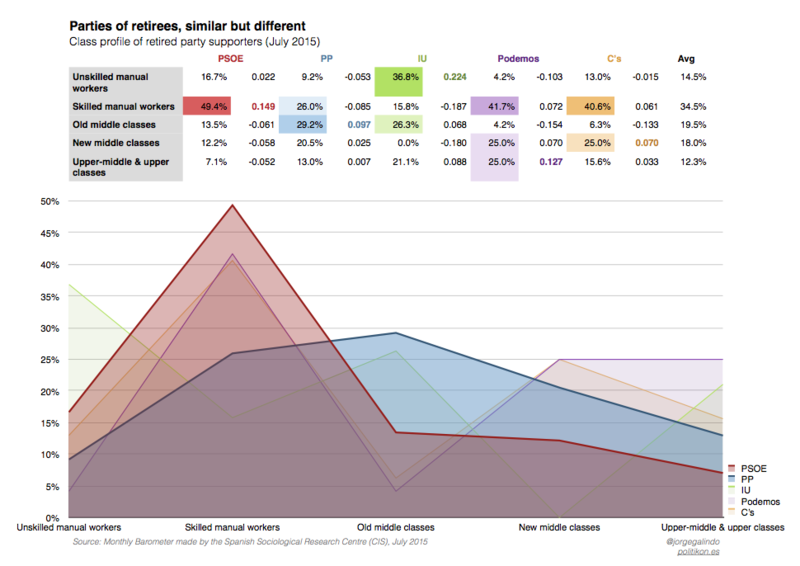 It won’t be much of a surprise that both insiders and the unemployed (for the PP) have lost importance among classic parties’ supporters, leaving the socialists and the conservatives as quite dependent from retired people. Not all retirees are equal. It is now the right moment to dissection each portion of the previous graph, starting with the first bloc. The PSOE has much more qualified manual workers among their retired voters, but the PP has a larger concentration of old & new middle classes, as well as higher classes. En cierta manera, esta tendencia se mantiene a la hora de observar la composición de los insiders dentro de cada partido. Mientras los votantes y simpatizantes del PP que trabajan y viven en un hogar cuya persona de referencia tiene un contrato fijo se concentran excepcionalmente en los empleados cualificados y semicualificados del sector servicios, entre los del PSOE la presencia de obreros manuales y de trabajadores poco cualificados es considerablemente mayor, pese a que aún no llegan a sumar para constituir una mayoría. To a certain extent, this trend is maintained when we observe the composition of insider-led household members within each party. While supporters of the PP who work and live in a household whose reference person has an open-ended contract the are mostly qualified and semi-skilled service sector employees, among PSOE’s manual and unskilled workers have a much stronger presence, although they still fail to constitute a majority. Ciudadanos, por su parte, complementa la considerable presencia de directivos y autónomos en sus filas con una considerable cantidad de gerentes y profesionales liberales, pero también de “clases medias ocupadas en el sector servicios”. El perfil de los hogares insiders de Podemos es sorprendentemente similar, con una salvedad importante: la mayor presencia de obreros cualificados con respecto a la media, ofreciendo un perfil más mixto. Ciudadanos complements the significant presence of managers and self-employed in its ranks with a large number of managers and qualified professionals, but also middle class workers occupied in the service sector. The profile of ‘household insiders’ among Podemos is relatively similar, with one important caveat: the increased presence of skilled workers relative to the average, offering a mixed profile. Among managers and entrepreneurs, Ciudadanos shows as well a markedly higher profile, in this case measured by education level, with respect to other parties and the overall population. The trend gets confirmed when outsiders’ composition (quick reminder: people who work and live in households where the reference person has a temporary contract or is unemployed): those who support Ciudadanos, Podemos & Izquierda Unida have a higher skill profile. However, education is not everything. It is quite illustrative to observe that Podemos is the party where overqualified workers find themselves with more relative power: above 12% of the ‘purple’ supporters fall into this category. Overqualified does not mean poor. Observing the supporters’ distribution depending on individual income, Podemos displays an above-average profile , only below Ciudadanos and (partially) IU. The communist-green coalition has two peaks: working class (presumably from Asturias and Andalusia) and gauche divine. The socialists display the lowest income profile. This is clearly influenced by age structure, which does not change the fact that the PSOE voter is poorer. As a matter of fact, an alternative calculation excluding retired people from the data does not significantly change the displayed profile. All these data overload can be interpreted if the reader is willing to embark on adventurous hypothesis elaboration. A picture (or rather a useful caricature) of four prototypical parties emerge: the conservative (PP), the market-oriented reformist (Ciudadanos – C’s), the divided socialism (PSOE) and the angry youth party (Podemos). Almost half of PP voters do not participate in the labour market. 40% are over 64 years old. Among the non-active people, middle and upper-middle classes constitute a clear majority (65%). Middle classes dominate as well among working age supporters. Its supporter with a manager status does not have a particularly high profile when it is compared with the average. But there are no overqualified people among its voters. From this point of view, the ‘adventurous hypothesis’ would be that PP supporters are those whose expectative not been dramatically affected by the crisis. In other words: those that can buy into its main campaigning message, based on “recovery is here, we have done what was needed, now it is not the right moment to experiment”. The conservative position has not one but two nemeses. On the one side, Podemos is the party of those who radically oppose to the ‘success’ frame: there is no recovery, they seem to say, but a systemic crisis. 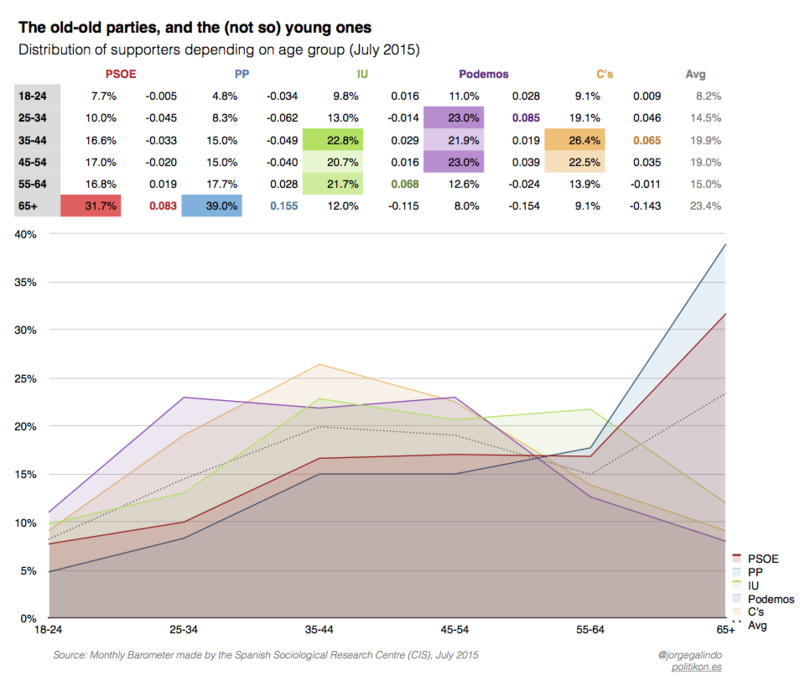 Its supporters are way younger than those of other parties. Their income profile is a bit above the average, but 35% of them are either unemployed or have a temporary contract, contrasting with a slim 16% for the PP. Those workers in ‘outsider households’ are more skilled than the average. Therefore, it is not surprising that 12.6% of them is overqualified. Only a 18% is out of the economically active population. Around this core of ‘losers (of expectations)’, there is a cover of open-ended workers (32%) where both qualified technicians and manual workers reflect probably the vote absorbed from both socialists and communists. It looks like those who are not willing under any circumstance to assume the official narrative on crisis and recovery. On the other side we find Ciudadanos, a party where, as in Podemos, most supporters are labour market participants (83%). And, as in Podemos, their profile is a bit younger than the average, although this time the 35-44 age group stands out. Nevertheless, outsiders are less than in Iglesias’ party (26%) and belong mostly to new middle classes, being substantially more qualified than those from other parties. As for insiders, middle and upper-middle classes from service sector are clearly overrepresented. As managers & employers, whose weight is at 11.3%. These are quite more skilled than the average, particularly when put against the PP managerial support. The class profile of Ciudadanos is clearly above that for other parties. Its reformist discourse squares well with the image of new middle classes, upper-middle classes and elites with a strong interest on advancing liberalization. Among these three extremes, classic socialism has not found its place. It is clear that the age structure of PSOE’s supporters is more similar to the PP than to the rest. But these older, non-active people have a very different profile, with a clear majority of manual workers. 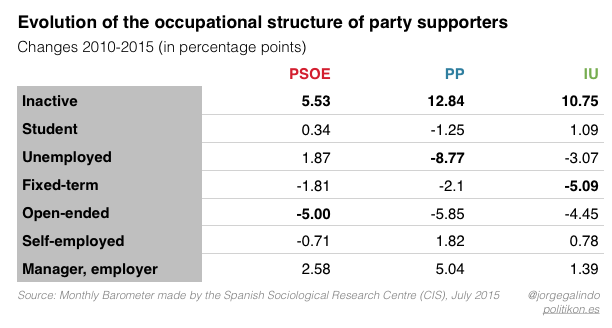 The class-based differences are even more evident when observing the income profile of supporters: the PSOE is sharply below the rest. Despite the relative losses that the socialists have suffered from supporters with permanent contracts, they retain the largest core of industrial workers and unskilled. Many of their outsiders also belong to this category. The socialist insistence on the idea of ​​”reindustrialization” is best understood under the light of this data, coupled with the fact that such voters also represent the core of militancy of the sister union, UGT. But they coexist with a huge number of working class retirees and with the highest representation of middle-low and low class among all parties. It is very difficult to build a coherent platform that leave them all well satisfied, let alone recovering lost voters or appealing to new ones. At the end of the day, the retirees has been the least affected social group in this crisis thanks to the structure of the Spanish welfare state, while the poorest working classes have taken a big blow that could have been cushioned with an alternative system. But under a heavy budget constraint it is not credible to suggest a change towards such alternative without assuming that there will be either spending cuts in other sections or tax increases. In addition, a considerable amount of people of lower middle and lower class have difficulty finding a decent position in the labor market in part because of our regulatory and welfare model, which benefits precisely the industrial working class voter. In short, a very hard puzzle. *The division between those with permanent (insiders) and temporary (outsiders) contracts refers to the reference person in the household, who may or may not be the one questioned. This is due to the methodology followed by the CIS. Therefore, these categories represent actively working people who do not belong to any of the other categories, who are living in a household where either him or someone with higher income has a permanent contract or a temporary one. In most cases, if the reference person has a temporary contract, all other household members who work have it as well. But the opposite does not hold so often. Therefore, the bias introduced by the use of the question tends to reduce the representation of temporary workers. Whenever I make references to permanent, temporary workers, insiders or outsiders the reader must take this into account. ** From now on, the used samples tend to be smaller, which means that it is essential to take all the results with a grain of salt.